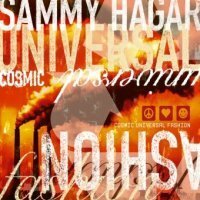 Until recently my days as a Sammy Hagar fan were well and truly behind me. I didn’t rate his work with Van Halen that highly, hadn’t bought any of his solo albums since his self-titled 1987 release and didn’t think his appearance at the Sweden Rock Festival a few years ago was in the same league as his legendary early 80’s UK tours. On a recent trip to Canada I picked up all his last few albums for the princely sum of $2 each, and whilst the stuff with the Waborita’s was very patchy indeed, it was worth the money I spent just for his latter-day classic ‘Marching To Mars’. Unfortunately his new ‘Cosmic Universal Fashion’ CD (his first for Roadrunner Records) adds another hit and miss album to his legacy. Recorded in bits and pieces it’s a shame that the songs themselves usually don’t live up to the interesting stories behind them – at it’s best it’s merely quite good, but at it’s worst it’s virtually unlistenable. The title track for instance was a collaboration with an Iraqi musician from back in 2001, which for obvious reasons couldn’t be released to a US audience until the conflict between the two countries had settled down a bit. It’s a heavy modern rocker with an industrial feel, and while I complement Sammy for trying something different, it doesn’t really do any for me other than acknowledging that Sammy still has a great voice. Similarly, many of the other tracks seem to be brave experiments with other genres, like Chilli Peppers’ style funk (‘Switch On The Light’), new country (‘When The Sun Don’t Shine’) and groovy modern rock (‘24365’), but none of these songs are anything to write home about either. The best tracks are the fun feelgood rocker ‘Loud’ and two really heavy tracks from the aborted Planet US project, ‘Psycho Vertigo’ and ‘Peephole’, the latter aired already on Neal Schon’s Soul Sirkus CD, whilst ‘I’m On A Roll’ is similar to Van Halen, although ironically it sounds more Dave than Sammy. At the other end of the spectrum there a version of The Beastie Boys’ ‘Fight For Your Right To Party’ (with guest Adam Horowitz) which adds absolutely nothing to the original, and a totally pointless live recording of Sammy plodding his way through Van Halen’s ‘Dreams’, which he morphs into ‘Cabo Wabo’. ‘Cosmic Universal Fashion’ sounds like it’s been cobbled together and doesn’t flow at all. I’m not really sure what he hopes to achieve by it or why Roadrunner chose to release it, but I do know that I won’t be playing it very often. Very disappointing indeed.